The One-Legged Woman Who Was "the Most Dangerous Of All Allied Spies"
Her name was Virginia Hall, an American spy born in Baltimore in 1906. She attended both Barnard College and Radcliffe College—two prestigious all-women’s higher education facilities—and continued her studies at schools in France, Germany, and Austria. She had dreams of a career in foreign service. At just twenty-five years old, she was appointed to the position of Consular Service clerk at the American Embassy in Warsaw, Poland and seemed to be well on her way to accomplishing her goals. Unfortunately, the disability made her ineligible to pursue her career further. For the next several years, she worked as a clerical assistant for the State Department in Turkey, Italy, and Estonia, before “hitting the glass ceiling” in her field of work despite a few stunning bullet points on her resume, such as that she was fluent in Italian, German, and French. She resigned in 1939 just as war started to inch across Europe. Being the powerful, ambitious young woman that she was, Hall didn’t flee the continent for the safer shores of her homeland. Rather, she volunteered as an ambulance driver in France until the French surrendered in 1940. From there, she evacuated to England where she took up another clerical position at the American Embassy in London. Hall soon caught the attention of the British Special Operations Executive which was looking for agents to work with the French resistance. Thus, in 1941, Hall posed as a correspondent for the New York Post when she arrived in Lyon, France. Her code name was Marie Monin, and she was the SOE’s very first female agent in France. She spent the next fourteen months providing courier services, helping downed fliers and runaway POWs escape, and obtaining materials for clandestine presses. The sale of press materials, such as paper and ink, was prohibited, making it difficult for resistance newspapers to create and spread their ideas. Thanks to help from Hall and others like her, by 1942 resistance papers had reached over two million readers in France. All the while, Hall continued to send documents to the New York Post to maintain her cover. Hall made a convincing argument, and after another brief stint in London—becoming proficient in Morse code—she was sent again to France via a British torpedo boat. This time, she was working for the United States Office of Strategic Services. The mission was incredibly dangerous; the Germans were still looking for her and if she was found she would likely lose her life. Taking precautions, she disguised herself as an elderly French milkmaid by dying her hair grey, wearing full skirts to hide her small frame, and walking with a slow, shuffling gait to disguise her limp. She made goat cheese and went into town to sell it—all the while listening to the oblivious German soldiers chatter about their work. Forced to stay on the move by German forces attempting to track her radio signals, Hall proved a slippery spy and eluded capture. When she wasn’t listening in on German soldier’s banter, she trained three battalions of French resistance fighters to wage guerrilla warfare against the Germans. Before Allied forces overtook her team, Hall reported that they had destroyed rail lines, phone lines, bridges, and freight trains, sabotaging infrastructure necessary to German occupation. The team was credited with killing over 150 German soldiers and capturing 500 more. For all her efforts during WWII, she was made an honorary member of the Order of the British Empire. She was also awarded the Distinguished Service Cross, one of the United States’ highest military honours—the only civilian woman to be awarded the medal during World War II. 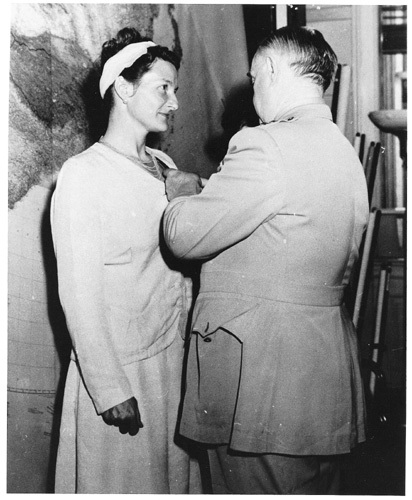 President Truman wanted a public party to celebrate the award, but Hall opted for a private ceremony with just her mother and General William Joseph Donovan in attendance. She said she was “still operational and most anxious to get busy.” She didn’t want a public ceremony to make her face known. In 1951, Hall joined the CIA, working as a French parliamentary intelligence analyst. It was quite a feat for a woman who thought she had reached the glass ceiling a decade before. By the time she retired in 1966, Hall had shattered the glass ceiling and expectations for women in her line of work—and all on just one leg. Former Major Leaguer Moe Berg was Once a Secret Agent for the U.S.